The scene is all too common for so many people: A vivid, but mostly nonsensical series of events plays out in a lengthy reverie during a long night, only to ultimately be recalled in fragmented pieces. The dreamer at hand ends up unsure of what played in their mind and what has already dissipated into the abyss that exists between consciousness and sleep. In many ways – and not simply from the parallel of a single term – the story of Brooklyn-turned-Los-Angeles trio, Dreamers, has played out in a similar fashion. 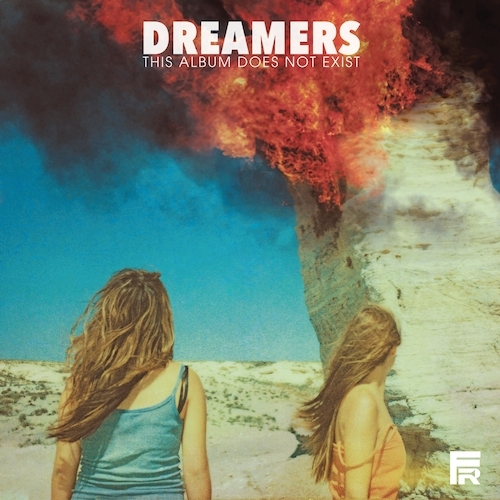 Dreamers might appear to be an indie lover’s dream come true – an overnight, out of nowhere success of shockingly on-point proportions – but it is absolutely worth noting, for those who will be seeing Dreamers’ name for the first time alongside This Album Does Not Exist (Fairfax Recordings, 2016) on shelves across the U.S. today, that it has been a long road for the power pop / 70s punk influenced band, which has been persistent in its quest since 2014. The progress that has unfolded since the group’s kickoff is applause worthy but didn’t happen without a long trail of work, changes, persistence, and sonic evolution in the background and, for those that have been aware of the trio since their unsigned New York borough days, the falsehood now present in the title of Dreamers’ full length debut could not be more deserving of excitement. Calling This Album Does Not Exist a long-awaited project is no hyperbolic descriptor. While it may follow the five track EP, You Are Here (Fairfax Recordings, 2016), that was released just six months ago, the total two-year wait for these 12 tracks indeed felt long. The reason being, Dreamers had the kind of less-common stylistic fusion in classic punk and power pop, alongside clever metaphors in their early songwriting, that made it clear virtually no one associated the wait with a lack of compositional creativity. Thankfully, the wait is over and whether heard in the context of Dreamers’ full history or after a spontaneous, record shop purchase spurred on by the ironic title, listeners will get a well-tempered balance of young Dreamers’ quirks and seasoned Dreamers’ refinement that, in the case of either listening context, will be an energetic and fun experience. Speaking of context, it should be noted that anyone who picked up You Are Here will recognize nearly half the tracks on This Album Does Not Exist. Each of those songs is present on the full length. (“Drugs,” “Wolves (You Got Me),” “Shooting Shadows,” “Never Too Late To Dance,” “Come Down Slow”) This decision isn’t one seen executed too often, as it can leave a bit of a déjà vu sensation in one’s mind but at 21 minutes sans inclusion, “Does Not Exist” would end up as more of a third EP otherwise so the move is understandable. Nevertheless, the remaining seven fresh tracks manage to traverse a wide field of hooks, melodies, and a new batch of unforgettable metaphors to complement their established predecessors. When combined, the 12 songs reside under the singular thematic roof of extreme attractions and powerful reactions – with the latter not always for the better. Though attraction and reaction usually warrant correlations to relationships, a wider generalization fits, thanks to the unique focus of leading track, “Drugs.” Practically screaming for surface level controversy at the outset (Coming down / searching for the next high), this opener isn’t about its face value object, nor is it applied in a manner à la Kesha’s “Your Love is My Drug.” Rather, “Drugs” taps into the current technology oriented obsession of today’s populous; perhaps a bit unfairly placing the 25 and under generation in the guiltiest-party spotlight (Don’t wanna think for ourselves / we’re just millennials). Past this mid-tempo, groupthink-fueled, introduction, the album does dive right into the revolving door of relationship joys and pains. Despite the presence of pain in the lyrics however (I’m still in love you never left my mind / You know it’s extra tough to see your face tonight), many of Dreamers’ romantic counterparts are recalled through a hazy or pleasurable lens, with the contextual metaphors always providing a superficially favorable option (dancing, pain relief, partying) that outweighs the obvious problems on hand. Most amusingly, the trio even gets mildly self-referential, while maintaining appropriate thematic metaphors in “Come Down Slow” (Daydreamer stuck inside myself / talking like I don’t need your help). Everything from manipulation (Wolves (You Got Me),“Shooting Shadows”), smug satisfaction from a retracted rejection (“Cry Out For Me”), and fixation (“Lucky Dog”), to the endless on-off (“Come Down Slow”), plays out through songs each containing definitive downbeats provided by bass, kick, and-or snare. This ensures the album never loses momentum and the listener never falls out of the enthralling groove, much the same way the protagonist often can’t seem to tear away from the appeal of given or received drama. Track tempos slide up and down throughout, supporting the idea of high and low energies but the count is a continuously audible and driving element, showcasing Dreamers’ affinities for fare from the likes of The Ramones, The Misfits, The Clash, and The Talking Heads (two of which are referenced outright in “Sweet Disaster”). Other aspects throughout the album, like the looser tone set on Nelson’s bass, the gritty guitar turned up against doubled vocals, and heavy vocal filtering on certain song verses to evoke a pseudo-mono sound, all further support the punk rock foundations of Dreamers now more fleshed out style, that has since gained enthusiastic support from the alternative rock realm. When skimmed over as a whole, This Album Does Not Exist might appear conceptually shallow. Lust, love, breakup, rebound, repeat. After the routine is learned, what’s left? Except, once every factor of this record – arrangement, production, lyrics, word play, concept – is given equal consideration, a final layer of more substantial cleverness reveals itself in how these components manage to work together to create a debut loaded with creative subtleties best noticed within the full project over any of its parts alone. This Album Does Not Exist is out now via Fairfax Recordings. Get it from iTunes, Google Play, Amazon. Stream available on Spotify and Apple Music.